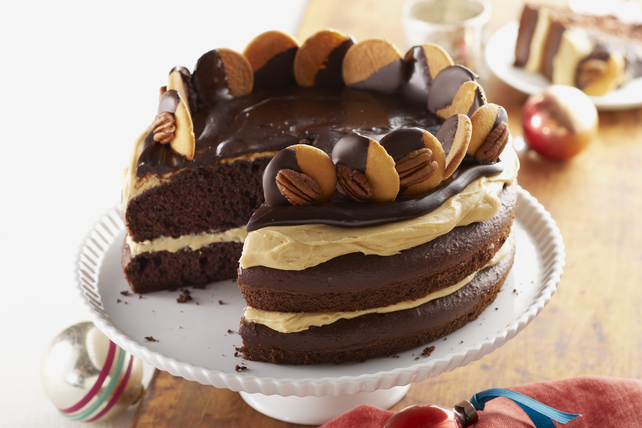 The oohs and ahhs will be for you instead of the waiter when you serve this Turtle Cake with layers of caramel filling and chocolate-dipped wafers. Spoon half the Cool Whip into bowl; refrigerate to thaw. Return remaining Cool Whip to freezer. Prepare cake batter and bake as directed on package for 2 (9-inch) round layers, adding dry pudding mix to cake mix in bowl before mixing with liquid ingredients. Cool cakes in pans 10 min. ; invert onto wire racks. Remove pans. Cool cakes completely. Meanwhile, microwave caramels and water in microwaveable bowl on HIGH 1-1/2 min. or until caramels are completely melted and mixture is well blended, stirring every 45 sec. Cool slightly. Beat cream cheese in large bowl with mixer until creamy. Add caramel sauce; mix well. Blend in thawed Cool Whip. Stack cake layers on plate, spreading cream cheese mixture between layers and onto top of cake. Refrigerate while preparing chocolate glaze and garnishes. Cover baking sheet with parchment. Melt 2 oz. chocolate as directed on package. Dip half of each wafer in chocolate; place on prepared baking sheet. Top with nuts. Refrigerate until ready to use. Microwave frozen Cool Whip and remaining chocolate in microwaveable bowl 3 min. or until chocolate is completely melted and mixture is well blended, stirring after each minute. Cool 10 min. Spread Cool Whip mixture onto top of cake. Garnish with wafers. Keep refrigerated. For a more fudge-like texture, store cake in refrigerator overnight. Garnish with chocolate-dipped wafers just before serving. Substitute 13x9-inch pan for the round pans, and increase the baking time to 35 to 38 min. or until toothpick inserted in centre comes out clean; cool completely. Continue as directed, spreading caramel mixture, then chocolate mixture over cake in pan.